Our man in the field, Tom Burka, reporting virtually live from the Republican National Convention, has managed to phone in his very first report. Update: Some readers wanted me to post the text of the audio: "From where I stand here just outside the Republican National Convention, Madison Square Garden is startlingly different from any other object in sight. It is an enormous pyramidal structure of glittering white concrete, soaring up, terrace after terrace, 300 metres into the air. From where I stand now it is just possible to read, picked out on its white face in elegant lettering, the three slogans of the Republican Party: 'WAR IS PEACE,' 'FREEDOM IS SLAVERY,' and 'IGNORANCE IS STRENGTH.'" I've spent the past weeks mainly catching up on deadlines at work and the like and not enough time in blogtopia (skippy, skippy, skippy ctp). I'm not promising full coverage of the RNC, but I can promise some special, excellent graphics by designer Bill Tyler that will appropriately welcome the Republicans to New York (thanks, Bill! ), and as much blogging (and maybe some audioblogging) as I can fit in. Let's see if we can make it through the week. Update: You can click on the button, too. Challenged by Navy records showing that Larry Thurlow, a Swift boat veteran, was at best mistaken and at worst a colossal liar when he swore that John Kerry had been deliberately dishonest about his Vietnam war record, Thurlow has now taken the position that the entire Vietnam war was "a sham." "It never happened," said Thurlow. "The so-called 'war' was nothing more than an immense government con game." Thurlow claimed that he and the other Swift boat veterans spent the so-called war years "sunning themselves on beaches in the Mediterranean," and that not only did John Kerry take part in that, he was "the tannest of them all." "By the end of the war," said Thurlow. "Kerry was a complete bronze. That's why he got the star." Asked how it could be possible that the government could have tricked the American people into believing the country had been involved in a war that had never occurred, Turlow said, "It's easy. Say something loudly and frequently enough and people will believe anything." "Let me tell you," he added. "I know exactly how it's done." In a transparently mercantile bid to keep protesters from disrupting the Republican National Convention later this month, the Bloomberg administration will offer "peaceful political activists" discounts at select hotels, museums, stores and restaurants around town . . . [Mayor] Bloomberg conceded yesterday that not everyone who wore a button would be strictly vetted for his or her peacefulness. "Unfortunately, we can't stop an anarchist from getting a button," he said . . .
Anarchists are planning to destroy the financial infrastucture of New York City during the Republican National Convention, "discounting the city to death" through the use of buttons designed to encourage peacefulness in visiting protestors. "We will bring this city to its knees!" said "Mad" Alvin O'Zool, self-described anarchist and atheist. "These buttons are just the opportunity we've been waiting for." The buttons will confer discounts at Applebee's and Mamie's Spoonbread restaurants, among other wildly desirable New York eateries. "The delegates will be getting discounts, the protestors will be getting discounts -- when we anarchists use these pins to get massive discounts we will bring the city to the very brink of financial ruin!" O'Zool cried. Mayor Bloomberg waxed philosphical on the question of whether violent protestors and radicals other than the anarchists will be cutting a wide swath of incendiary chaos and then wrongly using the pins to obtain satisfying, hot discounted meals. "As long as they don't try to peacefully protest in Central Park," he said. "Anything but that." Today, just after James McGreevey resigned his post as Governor of New Jersey while revealing himself to be a homosexual, New York City Mayor Michael Bloomberg announced his resignation on the grounds that he had had "multiple metrosexual assignations." "It started off slowly, a manicure every so often," said an aide. "A facial here and there, some artificial tanning, and before you knew it he was into heavy duty skin moisturizers, hair care products -- the works. Sooner or later it was bound to get out." "I am a fey American," said Mayor Bloomberg in an emotional and stunning speech to the city. Critics claimed the Mayor resigned more out of jealousy of Governor McGreevey than out of civic duty. "Whatever they can do in New Jersey, we can do a thousand times better in New York," said an unamed former New York City official, the dead Fiorello LaGuardia. "Bloomberg wasn't going to let McGreevey grab the spotlight for more than a second." Democrats bemoaned the timing of the resignations, saying that McGreevey, a Democrat, could have at least waited until the last day of the Republican National Convention to make his announcement. Thanks to Christopher Rabb of Afro-Netizen for the headline and idea. Everyone should immediately go check out his blog. Doctors were flown to Pensacola, Florida yesterday to consider surgical separation of George W. Bush and Senator John McCain after a campaign-related incident in which the two politicians accidentally shared the same brain. "This is very risky," said Dr. Chaim Kneecapowitz of the Children's Hospital of Philadelphia. "We've never successfully separated two politicians, particularly two conservatives." "I can't say that John McCain will ever be the same again," said Kneecapwotz. "We might be able to give him some of his former functionality, but I'm not sure he'll ever be able to work with a Democrat again." "We can save him," Dr. Cheryl Misk-Hugh agreed. "But he won't be talking about campaign finance reform aqain." 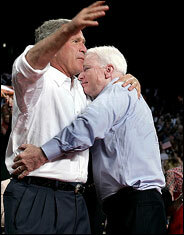 Karl Rove has insisted that the first priority in the surgery will be to restore George W. Bush to his former self. "Not the young boozer and drug taker," he said. "But we're looking to save the former self who was in thrall to corporate interests and the religious right." The State of Illinois has raised a general "alert" to signal what it is calling the "imminent candidacy" of Alan Keyes for U.S. Senator. "We just wanted people to be on their guard," said Pierre Dupont XXXV, a minor functionary in the Illinois Department of Vagueness. Alan Keyes has apparently agreed to enter the Senate race against Barack Obama in Illinois. "It's a genuine matter of concern for most people," said Dupont. "I certainly would want to know before I went about my daily business." Some have already blamed Keye's candidacy for causing a large drop in job growth reported this morning, while others are concerned that Keyes's forceful but insane oratory will cause crop damage, tornados, and coastal flooding. Citicorp employees collectively railed against the fact that the Bush Administration yesterday announced an "orange alert" for a threat to their building which, it turns out, was based upon documents that were three or four years old. Employees were angry because, they said, they should have been given the four years off while higher-ups "worked to counter the threat." "Do you know what I could have done with that time?' said Sally Ackerman, who works in Accounts Receivable. "Dude," said Larry Hammerman, a 28-year-old filing clerk, "I coulda probably finished, like, playing the entire PlayStation 2 catalogue." Citicorp has a little known policy that employees may take "emergency leave" during a bomb threat. "And the way I see it is, this is like a bomb threat that has been goin' on for like four damn years," said Hammerman. High-ranking Citicorp officials scrambled to clarify the policy. "The policy was designed to permit employees to go home for an afternoon in the event of a bomb scare or other threat requiring that the building be evacuated," Juan Upsmanship, a Senior Vice-President, "We do not feel the current situation warrants evacuation."